If you’re ever worn satin or any other clingy fabrics, you know that they can involve unwanted wardrobe malfunctions. Static cling can make clothes stick to your legs or body in the wrong places, instead of flowing the way you want them to. Not exactly what you’re going for when you throw on a cool slip dress. Curious to find out how to get rid of static cling once and for all, we turned to celebrity stylist Anita Patrickson to find out her professional advice. She’s an expert at making celebrities head-to-toe look flawless on the red carpet and has had plenty of experience combatting static. Ahead, she’s sharing her foolproof tips for banishing static for good. Keep reading to find out Anita Patrickson’s top three tips for getting rid of static, and then shop silk pieces you can add to your closet worry-free. Static Guard spray—we always have some in our kit and it is the most failsafe way not to damage fabric! I often just lotion up legs and arms anywhere the fabric is slinging to and that will usually stop the problem. If I am out and about and have no lotion or static guard, I'll run my hands under the taps and flick the droplets from my wet hands onto the garment. This always stops static but beware of leaving watermarks on fabrics like brushed silk. Go on to shop for satin pieces you can wear without worrying about static. Ruffle detail adds fun volume to your outfit. Doesn't get more comfortable than a satin pair of culottes. Pair this slip dress with a pair of black pumps and vintage jewels. Style this ruffle skirt with floral shoes to make a statement. Bloggers are still donning pajama-influenced clothing in their street style. A timeless blouse totally office appropriate. Cami tanks are the most versatile pieces right now. 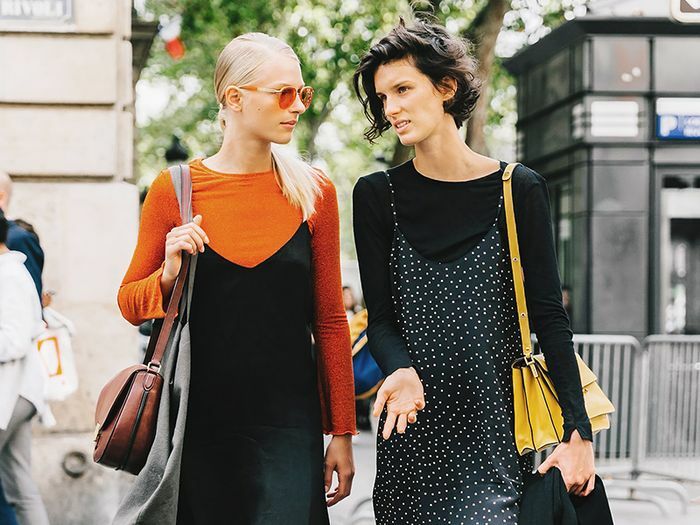 A silk dress is a sleek and fashion-forward dress alternative. Vintage girls love this up-and-coming line. Style this dress with a pair of sandals and a wide-brim hat during vacation. In need of a wedding guest dress? Wear this dress like an L.A. girl and throw on some white sneakers. Athleisure is a trend you should go for this summer. Dress this skirt up and down depending on your top of choice. A satin two-piece is simple yet elegant. A black satin dress is a necessary staple. Carry a vintage clutch with this jumpsuit. A satin tunic can be easily paired with any pant. Turn heads with this slip dress. Pair this vintage-influenced top with high-rise denim.